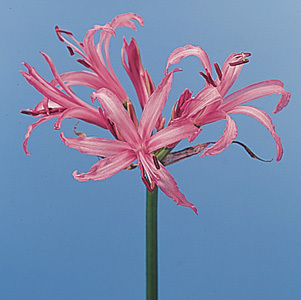 Home|Floral Library|Nerine – Nerine spp. Do not cut too tight as flowers (especially the youngests buds) will not open properly most of the time. A good time to cut is when just before the most mature bud opens, namely, full grown but not opened. One research report indicates that 45-50F is best and that it can be stored dry for 4-5 days. Another researcher states that 37-41F is best for storage of 3-5 days but higher temperatures (up to 50F) can be used if stored less than 3 days. Everyone agrees that they are somewhat chill sensitive and therefore should not be stored in the low 30s. Dry storage is better, especialy for flowers that are not too open. After Nerine, a sea nymph and daughter of Nereus in Greek mythology. Species used for cut flowers include N. bowdenii (bright pink), N. flexuosa, N. sarniensis. Cultivars include ‘Cherry Ripe’, ‘Pink Distinction’, ‘Pink Fairy’, ‘Radiant Queen’, ‘Salmon Supreme’ and ‘Virgo’. Similar to the genus Lycoris, namely, leaves are actually produced after the plant flowers, but not until the following spring, which to some means that leaves are produced first!